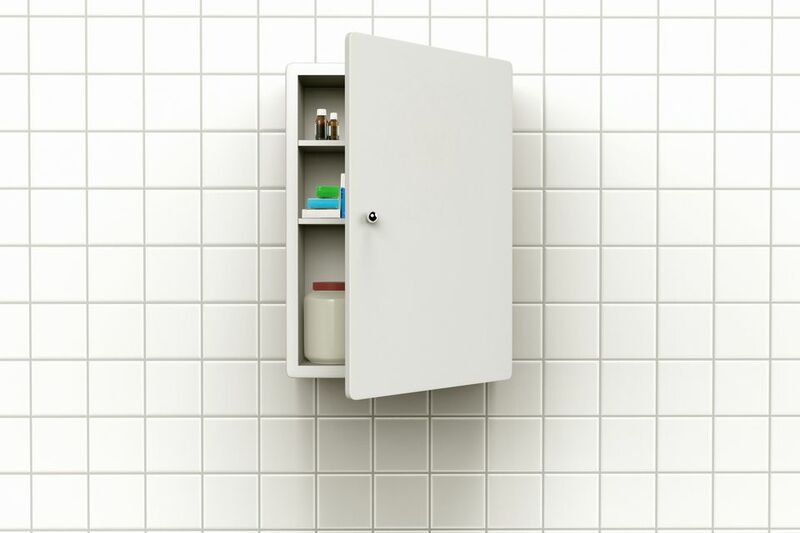 Most medicine cabinets are plain and sometimes dingy from use and age. If your house has an old medicine cabinet or you’re looking for a better organized, colorful medicine cabinet, revamp your existing or basic builders grade medicine cabinet to give it a new look. Clean out your medicine cabinet and get rid of any old medicine and toiletries that are expired, empty or you no longer use. Then, set aside all the items you want to keep in your medicine cabinet in a box or on the counter. If your medicine cabinet is plastic or glass, spray a bit of glass cleaner or another gentle cleanser on the shelves and wipe off with paper towels or a clean rag. If your medicine cabinet is made of wood, gently wipe down the shelves and sides of the cabinet with a solution of water and vinegar. This will also remove any odors from moisture. Keep the cabinet open to dry and you no longer smell the cleanser or vinegar. After you clean out your medicine cabinet, think of how you want to decorate it. If your medicine cabinet is a wooden built-in, you can repaint it to give it a new look. To paint the cabinet, remove any removable shelves or doors and set aside any hardware. Then, tape off any sections and hardware (such as a knob and hinges) you do not want to be painted with painter’s tape. Also, tape along the outside of the cabinet so you don’t get any paint outside of the cabinet. When all non-painted areas are taped off, sand all the painted areas with high grit sandpaper to prep the surface. Wipe off all sanded areas with a damp rag to remove any sanding dust. Then, apply multiple thin coats of primer until the entire area is covered. Let the primer thoroughly dry. After the primer is dry, apply multiple thin coats of paint. Let the paint dry at least 24 hours before attaching doors, hinges or knobs. Tip: If your bathroom has a window, open it to ventilate the room while painting. If you do not have a window, turn on the bathroom exhaust fan or place a large fan in the room and open all doors. You can apply any of the above items with double-sided tape or spray adhesive. After the backing is in place, put any removed shelves back into place. Tip: If you live in an apartment or rental home, consider using an easily removable tape or adhesive. Small bowls or jars to store cotton swabs, cotton balls, jewelry, and sample-size perfumes or colognes. Small glasses or cups to store razors, toothbrushes, tubes of medicine or toothpaste and combs and brushes. Small square boxes or baskets to store and organize any items you want, such as separating items for each bathroom user. Organizing your medicine cabinet not only makes it easier to find and grab your daily items, but to also separate items for roommates and couples.